The infamous SuperWebb group has launched a new adware application known as Lucky Bright. The group that developed it is notoriously known for crafting other intrusive programs such as Happy Cloud, Twinkle Star, Super Great, and many others. Thus, it is not at all surprising that we highly advise you to delete the adware program in question without any hesitation just like any of its counterparts. Make sure not to get fooled by misleading claims stating that you should use this program if you are a frequent online shopper because it should be a great asset by providing you with numerous discount deals, coupons, and promotional codes. In reality, all these statements are just a trick that vendors’ of this adware use to deceive naive Internet users. If, by any chance, this infectious program is already fully active on your computer make sure to use the removal guide that we provide below to delete Lucky Bright in just a few simple steps. Lucky Bright will make your online experience a miserable one in many ways. The most prominent way that it does so is by presenting you with all those annoying and worthless third-party ads, coupons, and pop-ups. Even though some of them might seem tempting, you should understand that, in fact, they will no way help you with your online shopping. What is particularly annoying is that at times this adware program could contact to a vast amount of different adware servers, resulting in a web browser entirely flooded with worthless a and invasive web content. In such case surfing the web the way you are used to almost impossible because you might be forced to stop whatever you were doing just to close all the ads and pop-ups. In addition to annoyance at times, this adware program is known to be used by other infectious applications as a backdoor into your operating system. Such instance is, of course, dangerous as not only suspicious but also potentially malicious programs could enter you PC in an easy manner. To surf the web the way you used to once again you need to execute a complete removal of Lucky Bright as soon as possible. Since no official website hosts a direct download link of Lucky Bright, it is rather safe to assume that this adware is mostly spread in other questionable ways. One such very popular way is via bundled installers. Such software bundles are filled with suspicious third-party programs and are mostly up for download on questionable third-party hosting websites. Therefore, avoiding such sites is a good idea because it will help you significantly reduce the chances of infecting your PC with any dubious program. Additionally you should know that running a professional antimalware tool on your PC is essential if you wish to keep your operating system safe and secure at all times. Make sure to implement one right now as it can warn you about any questionable websites or downloads in advance meaning that virtually no malicious program will be able to enter your operating system. Even though, the removal of Lucky Bright is relatively simple as you can terminate it via Control Panel, it still requires your utmost attention. This is so because even a single mistake could mean that the adware program was not removed entirely. As it turns out, such situation could have negative outcomes as just a few races of Lucky Bright could be used to silently restore it. 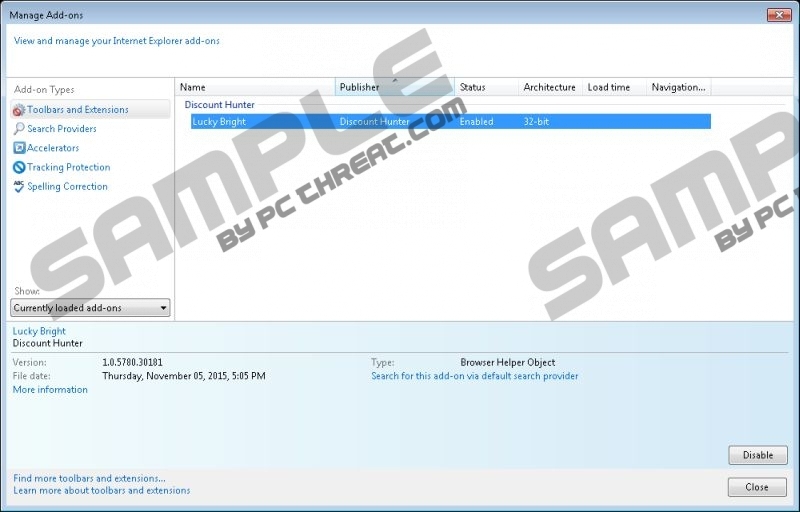 By conducting an in-depth analysis of your PC right after performing the manual removal, you can make sure that no files or registry entries associated with this adware are still active on your PC. Tap the Windows key on your keyboard. Select Lucky Bright and click the Uninstall button. Right-click Lucky Bright and select Uninstall. Type Control Panel into the search box. Quick & tested solution for Lucky Bright removal.